Community members on the Sapphire Coast are invited to join Dr Andrew Claridge, a Senior Research Scientist at the NSW National Parks and Widlife Service, who will be visiting the Bega Valley region in June to talk about his extensive research experience, in particular with nocturnal mammals. Andrew has 30 years of research under his belt, including many years in south-east Australia. 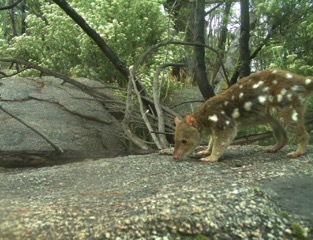 In his free community talk, Andrew will discuss the use of infrared cameras while studying quolls and show some great footage. “These days there are many benefits in using technology in wildlife research, but we also face plenty of challenges,” ge said. Andrew will also highlight the value of citizen science in field research, using rich examples of how this could make a real difference in the Sapphire Coast region. Liz Allen, a local citizen scientist, is just one community member who looks forward to discussing how the region might get involved in this kind of research. This free event is open to all interested people.